Prospects are fun. They allow us to dream on their basic skill sets and imagine greatness eventually produced at the major league level. First base prospects in specific present a certain type of vision. While the offensive standard for first basemen of late has plummeted, we still want that .300/.400/.500 type slugger at first for our favorite teams. It’s a commodity that has become increasingly hard to find over the last few years. We’re all still waiting for Eric Hosmer to break out. Yonder Alonso has yet to really show anything and Anthony Rizzo still struggles mightily against lefties. Paul Goldschmidt has been very impressive so far but not many people saw this level of production coming. The only true high-end first base prospect in the minors today is Jonathan Singleton for the Astros. With the help of the free archives of Baseball Prospectus (specifically Kevin Goldstein ‘s scouting reports from his Top 11 lists), I’m gonna look back a few years. This was a time with several high end first base prospects on the rise. These were supposed to be superstar level talents, getting on base at high clips and hitting for plenty of power. This is not meant to discredit Baseball Prospectus in any way; all five of these players were highly regarded throughout the industry. Just a glowing report. He’s gonna bring offensive firepower to Oakland for years to come. No doubt. FLAWLESS PLATE-DISCIPLINE. 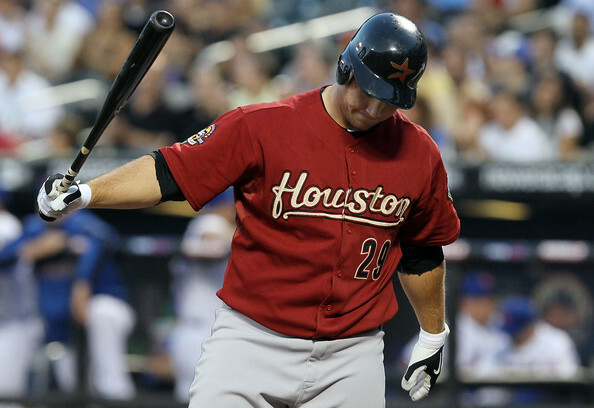 Besides a freak 2010 season, in which he expressed his “flawless plate-discipline” in the form of a major league leading 110 walks, Barton has yet to show much of the hitting acumen he was praised for as a prospect. 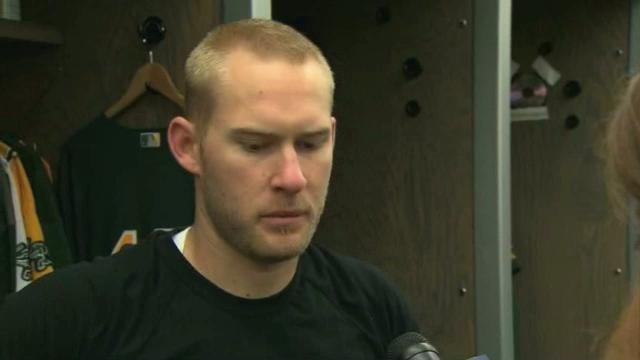 He has yet to play a game for Oakland this season, and has 27 career home runs through 1,901 career plate appearances. He has slugged .371 for his career. 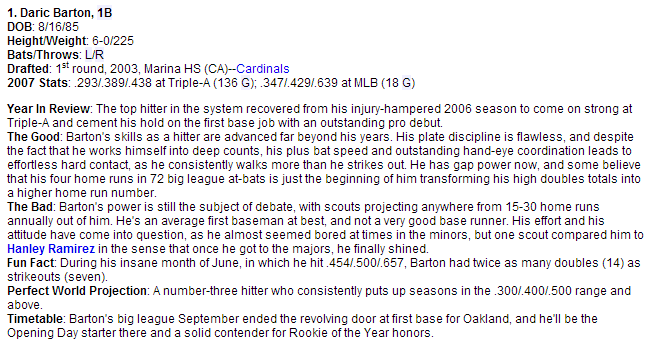 Daric Barton is 27 years old. An elite offensive talent. Maturity and intelligence well beyond his years. He’s going to mash. 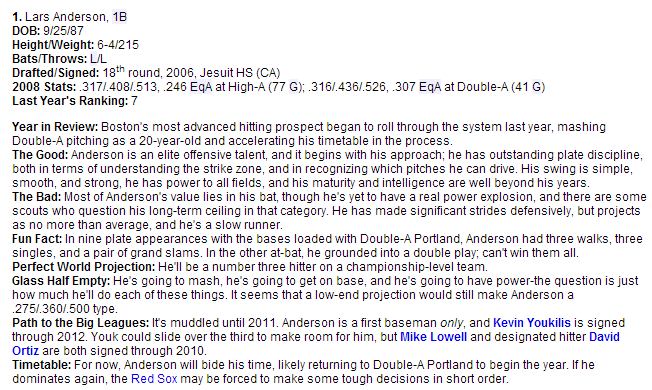 Anderson got 56 major league plate appearances over three years with the Red Sox in which he posted a .455 OPS. Last summer, the Sox finally gave up on Anderson and traded him to Cleveland for a knuckleballer named Steven Wright. Several months later, he was traded to Arizona. After that, he was DFA’d by Arizona, claimed by the White Sox, DFA’d by the White Sox, claimed by the Blue Jays, and finally traded back to the White Sox this April. He is currently slugging .267 at Triple-A Charlotte. Lars Anderson is 25 years old. The key piece in the Sabathia deal (!!!!!!). Plus-plus power to all fields. Cleanup hitter on a championship-level team. 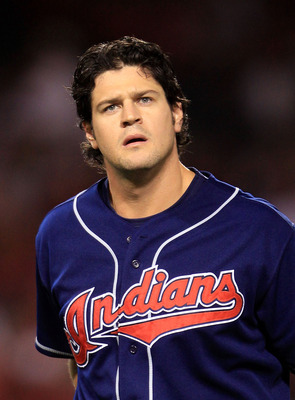 LaPorta has pretty much exhausted all of his opportunities to start for the Indians. He’s got a career OBP of .301 through 1068 plate appearances, with his “plus-plus power to all fields” only producing 31 home runs. He has not played a single game for Cleveland this season. Matt LaPorta is 28 years old. Outstanding hand/eye coordination. Enough arm for the hot corner (!!!!!!!!!!!!!). He’ll be among the league leaders in batting average. 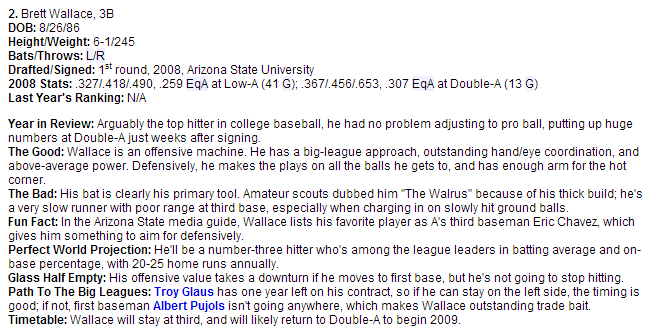 Outstanding trade bait indeed, as Wallace was traded three times before landing in Houston. 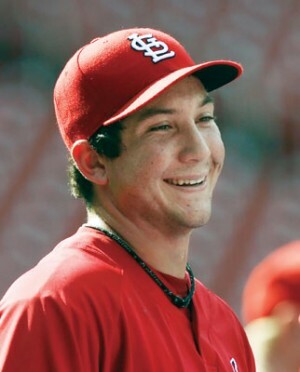 Since making his debut in 2010, Wallace has posted an OPS of .682 through 818 plate appearances. Both FanGraphs and Baseball-reference have Wallace at well below replacement level for his career. Before being optioned to Triple-A, Wallace started the 2013 season 1-24 with 17 strikeouts. Brett Wallace is 26 years old. An impact hitter in the middle of a lineup. Power from both sides of the plate. Let’s face it, HE’S GOING TO HIT. Since being traded to Seattle for CLIFF LEE in 2010, Smoak has disappointed the Mariners and their fans to the point that I’m not sure I’m gonna be able to get through this paragraph without getting emotional. Smoak has shown flashes of competency but has mainly expressed his appreciation for groundouts and lazy flyouts through the form of a .372 career slugging percentage over 1,500 plate appearances. As one of 17 first base/designated hitters on the Mariners, I’m curious to see how much playing time he gets this year as the season goes on. HE CAN’T BE THIS BAD. 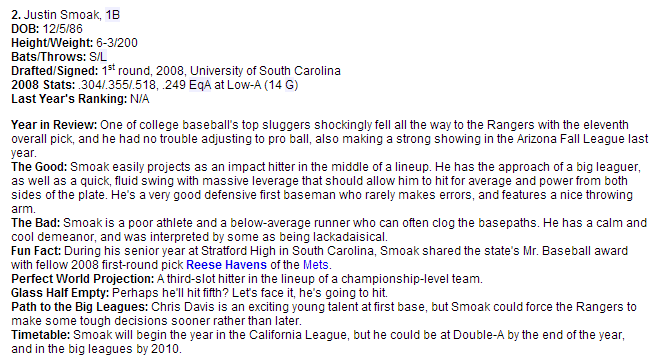 Justin Smoak is 26 years old. IN CONCLUSION…baseball is hard. It’s easy to look back at these failed prospects and get frustrated with what never came to be. I think it’s also a way to appreciate how incredibly difficult major league baseball is. 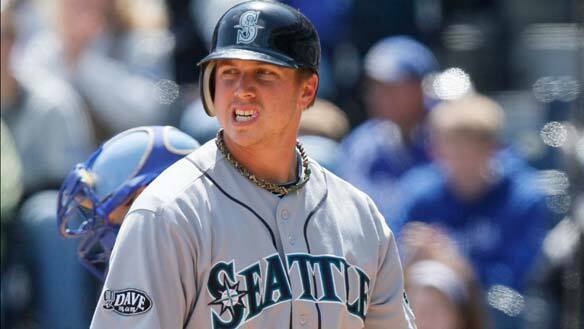 Justin Smoak is a horrendous major league baseball player but holy crap he is an amazing baseball player. It’s never stressed enough how insanely hard it is to succeed at the highest level of this sport. There are success stories, and there are these five players. All five player reached the major league level. And sure, over a combined 5,384 plate appearances they’ve only hit 122 home runs (one every 44 at-bats). And sure, they’ve amassed an astonishingly low total of 6.9 b-ref WAR and 3.5 FanGraphs WAR (which is even more nuts when you realize that Daric Barton’s 2010 alone was worth 5.4 wins and 4.8 wins respectively). But they reached a level that thousands upon thousands of players will never even sniff. Baseball is hard. 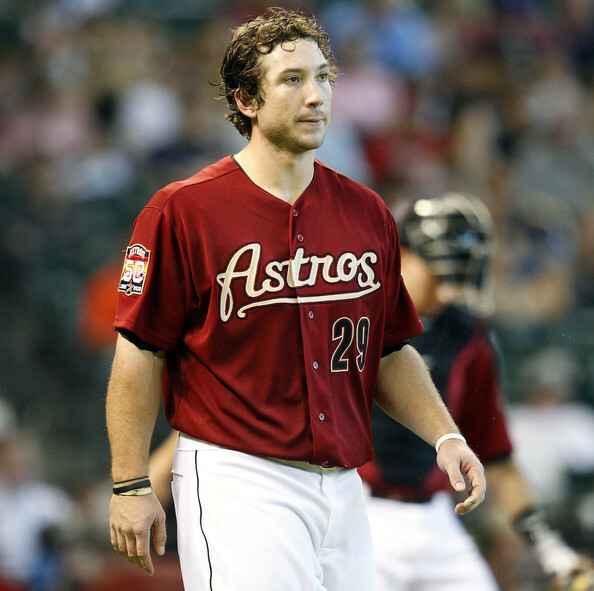 This entry was posted in #analysis, Dem Prospects, Randomness and tagged 2008, 2009, 2013, astros, baseball prospectus, brett wallace, cardinals, daric barton, first base prospects, Indians, justin smoak, kevin goldstein, lars anderson, mariners, matt laporta, rangers, red sox, scouting reports, top 11's. Matt LaPorta is still one of the top offensive forces in the minors. We saw him at the Triple-A All-Star game in Buffalo last year. 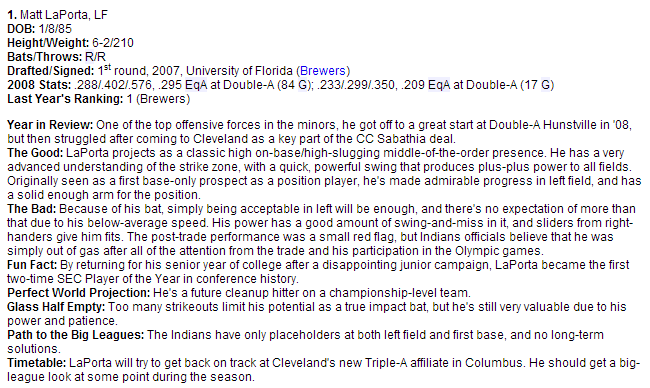 On the plus side, Cleveland also netted Michael Brantley in that CC trade.